All information is taken from Corner and Bas (1962). The cap of A. obsita is 20 - 45 mm wide, convex, becoming plane with a slightly depressed center or concave, pallid-whitish, sometimes pale fuscous in the center, with a sulcate-striate margin. The cap is sprinked with fine, grayish umber powder, dense over the disc, or the covering powdery layer breaks up into minute, dry warts. The gills are free, subdistant, and white then pale cream. The stem is 26 - 70 × 4 - 8 mm, cylindrical or attenuate upward, hollow, rather fragile, white, and exannulate. A small bulb is present at the stipe base; some remnants of the universal veil are present as irregular rings on the upper half of the bulb. The spores from dried material measure 5.8 - 6.7 × 5.2 - 6.1 µm (from fresh material, 6.5 - 7.5 (-8.0) × 6.0 - 7.0 (-7.5) µm) and are globose to subglobose to broadly ellipsoid and inamyloid. Clamps were not observed at the bases of basidia. 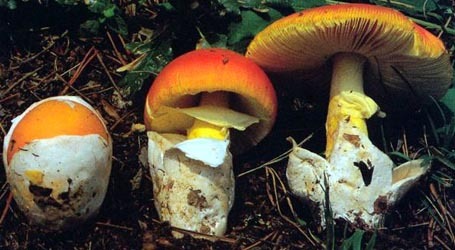 Amanita obsita was originally described from Singapore. author Corner & Bas. 1962. Persoonia 2: 292, pl. 8b, figs. 52-53. The following material is derived entirely from the protolog of the present taxon. pileus from protolog: 20 - 45 mm wide, pallid-whitish, sometimes pale fuscous over disc, convex, becoming plane with slightly depressed center or concave; context soft, fragile, white, 1.5 - 2.5 mm thick in center, very thin in limb; margin sulcate-striate almost to center; universal veil as sprinkling of fine grayish umber powder, dense over disk, or as powdery covering layer breaking up into minute warts, up to 0.5 mm wide, dry. lamellae from protolog: free, subdistant, white then pale cream, 2 - 4 mm broad, with 40 - 75 primaries, occasionally forked; lamellulae truncate; with 0 - 1 between each pair of otherwise adjacent lamellae. stipe from protolog: 26 - 70 mm × 3 - 6.5 mm, cylindric or attenuate upward, rather fragile, white, entirely finely cottony pruinose; bulb proportionately small; context hollow (not drawn in figures); exannulate; universal veil on stipe base and bulb, finely fuliginous pruinose or merely finely felted, without warts, with pale grayish umber cottony substance forming an abrupt but slight ridge. odor/taste Odor and taste not recorded. pileipellis from protolog: impossible to analyze in dried specimen. lamella trama from protolog: hard to analyze in dried material; inflated cells large, ellipsoid, up to 40 µm wide, up to (e.g.) 60 × 40 µm. subhymenium not described [probably due to state of tissues in exsiccata]. basidia from protolog: 32 - 40 × 10 - 12 µm, 4-sterigmate, with sterigmata about 4 µm long; no clamps observed. universal veil from protolog: On pileus: filamentous hyphae hyaline, loosely interwoven, 2.5 - 6 µm wide; inflated cells 15 - 45 µm wide, with umber sap, terminal singly or in short chains. lamella edge tissue from protolog: inflated cells 13 - 26 × 7 - 15 µm, clavate to subcylindric, thin-walled, colorless, forming sterile edge of lamella. from protolog: [-/-/-] 5.8 - 6.7 × 6.0 - 7.0 μm, (Q = 1.0 - 1.15; Q = 1.10), hyaline, colorless, smooth, thin-walled, amyloid, globose to subglobose to broadly ellipsoid; apiculus proportionately small to mediium-sized; contents monoguttulate; color in deposit not recorded. 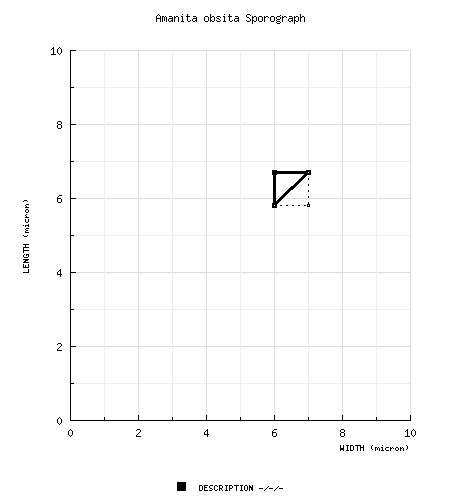 Note: Spores from fresh material reported to measure 6.5 - 7.5 (-8.0) × 6.0 - 7.0 (-7.5) μm. ecology from protolog: Solitary. Singapore: Terrestrial in tropical forest. material examined from protolog: SINGAPORE: Bukit Timah, 15.x.1939 E. J. H. Corner s.n. (holotype, L), 30.iv.1940 E. J. H. Corner s.n. (paratype, L, watercolor drawing only); Botanic Gardens, Gardens' Jungle, 13.viii.1940 (paratype, L, watercolor drawing only). discussion from protolog: "This species is very similar to A. farinosa from southern (sic) North America and Japan(sic). 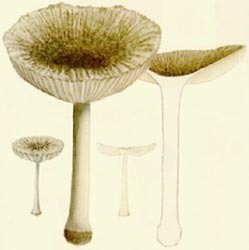 However, it has a pale cap covered by darker brown powdery remnants of the volva, whereas A. farinosa has a brown cap covered with “drab” powdery remnants. Comparing the Malayan specimen with collections of A. farinosa from North America (Hesler 22331, North Carolina) and Japan (Hongo 2018) the sphaerocysts in A. obsita appear to be of a much darker brown than those of A. farinosa. Although several authors state the spores of A. farinosa to be globulose, they are broadly ellipsoid to ellipsoid in the collections mentioned above (length-breadth ratio 1.25 - 1.4, average 1.3 in the first one and 1.1 - 1.35, average 1.2 in the second), which is more or less in accordance with figures of the spores as published by Gilbert (1941: 125, 199). Thus it seems justified to consider the Malayan material to represent an autonomous tropical ally of A. farinosa. "Undoubtedly, A. farinosa and A. obsita are closely related to A. subvaginata from Australia, New S. Wales, placed in Amanitopsis by Gilbert (1941: 75). This exannulate species has the same small size, the same striate pileus covered with grayish powder of the volva, and small globulose spores (7.5 - 9 µm wide). The basal part of the volva, however, is more coherent and forms a slightly marginate grayish coating of the bulbous base of the stipe." Sporograph comparison with other members of stirps Farinosa can be found in the discussion data field for A. farinosa. drawing Prof. E. J. H. Corner (1) Singapore, illustration from original description (Corner and Bas, 1962) reproduced by courtesy of Persoonia, Leiden, the Netherlands.